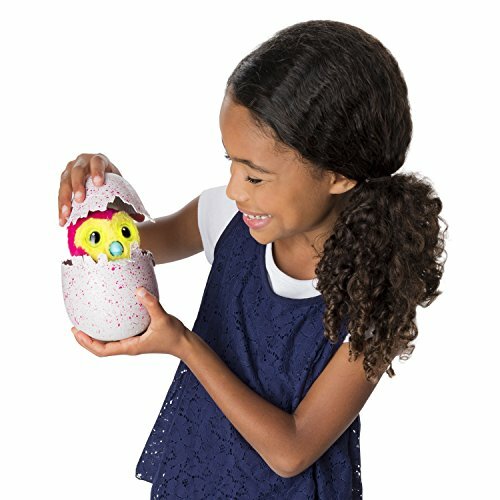 With no app or other device needed, Hatchimals break out of their shell to become interactive pets that grow through three different stages. This is the millennial Tamagotchi. A bird-like creature hatches from an egg, learning phrases, words, songs, and dances from its owner as it grows. 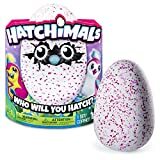 What makes Hatchimals stand out from other interactive toys? This one actually hatches from an egg. Seriously, it breaks through the shell using its little beak once it has received enough interaction from its owner. Once hatched, it grows through three more phases, learning more complicated tasks as it goes. Cuter than the original Furby, and won’t die in a pile of its own droppings like the Tamagotchi, Hatchimals have the benefit of being able to be reset back to its baby stage at any point so the growing can happen all over again. The hatching only happens once though, so be sure to enjoy it while it lasts. 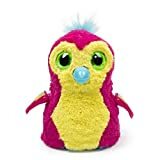 At current, the Hatchimals being sold on Amazon are stupidly overpriced. This is a toy that you should look for in stores or online at specific retailer's sites. 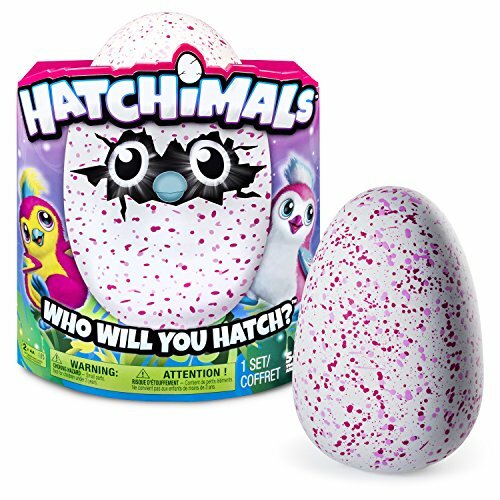 Hatchimals arrive inside a colorful egg, and start to hatch once they have received enough input from their owner. Eggs are about 10 inches tall. 2 AA batteries are included. More will eventually be needed, but most users don’t need new batteries until at least a couple of weeks of play. Users can pick the critter’s species, but the color is somewhat up to chance. Each box depicts two different color schemes, and the creature inside that egg will be one of those two. So even though the species can be catered to the owner, the particular color is always a surprise. There are a total of five species to choose from. Two of them, the Draggle and Penguala, can be found virtually anywhere. The other three species are exclusive to specific retail chains. Bearakeets can be found at Target, Burtles at Wal-Mart, and Owlicorns at Toys R Us. Though the exclusives *can* be found sometimes on Amazon, they will always be way more expensive than they normally are. This is because Amazon is not authorized to sell competitor’s exclusive products (duh), so these listings are from a seller who went to those stores, bought a couple of the toys, and put them up for sale at a jacked-up price, hoping to sell them before Amazon catches on. 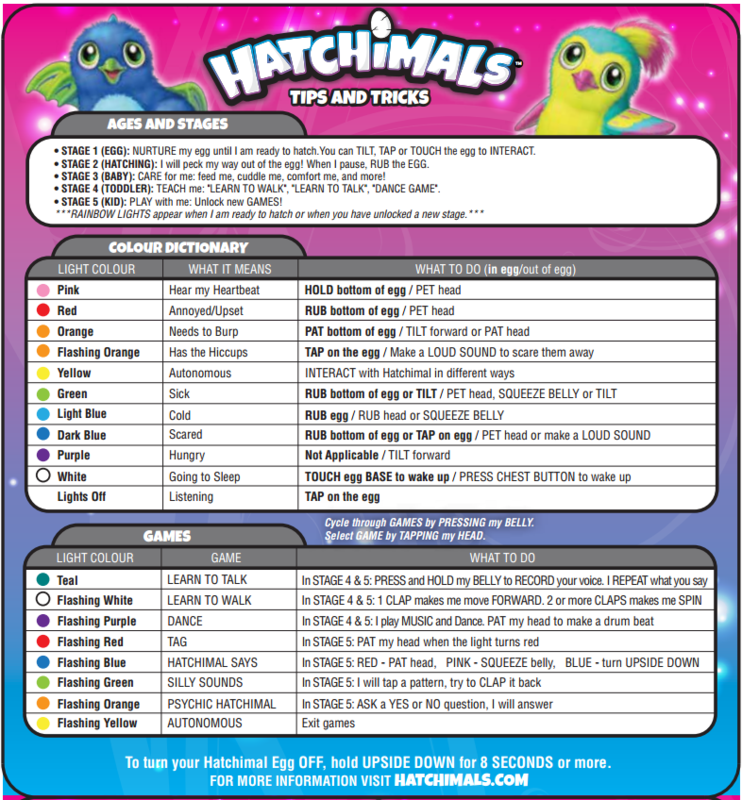 All store exclusive Hatchimals can be bought from that store’s online site, so please, do not fall prey to these scammers. If going to the store is not an option, search online at that specific retailer’s site. Hatchimals begin inside an egg. The egg uses touch technology to detect different hand movements, which will be different depending on the creature’s current needs. A pair of eyes glow behind the shell, changing color to indicate mood, hunger, sleepiness, and whatever else it needs you to know. Each toy includes a guide that tells exactly what each eye color means as well as the hand movement that is needed to satisfy the creature. For instance, if the glowing eyes turn light blue, the critter is cold and can be comforted by rubbing the egg. Once hatched, the creature still needs to be touched and interacted with in order to learn and grow. Hatching into its baby stage, the toy will grow into its toddler and kid stage. The kid stage is the final one, but it can be set back to the baby stage at any point by pressing the reset button on the underside of the toy. A paperclip or something small will be needed to press the button. Marketed towards both girls and boys, the Hatchimals line has five species to choose from. The Draggles are usually considered the ‘boy version’ due to the less pink or purple heavy color scheme, though of course, choose the one that best suits the child. Upon arrival, the egg has to be removed from the package, and given enough lovin’s before the hatching process will start. Fascinating and often compared to a scene right out of Jurassic Park, it’s almost impossible to look away from the little beak punching its way through the shell. Hatching times may vary, as will the time it takes to get the critter ready to hatch. Each toy has been randomly set with the time it needs, so don’t expect all toys to share the same schedule. The whole thing should be done within 40 minutes once removed from the package, so long as it gets the attention it needs. These needs can be determined by the color of the glowing eyes. The color can be seen through the shell, and will indicate whether the egg should be patted, rubbed, or held. Spin Master provides a guide that says what each color means, and which action to take. Once hatched, the eyes will continue to change color based on need, but also will change to show what mode it’s in, such as singing, or dancing, or games. In the toddler and kid stages the creature is able to repeat back words and phrases said to it. Just press and hold the belly to record something. Our testers forgot to let go of the button right after saying the word, so now our Hatchimal says “poop” before laughing for several seconds in its high-pitched electronic voice. New phrases can be recorded at any time once they stop being funny. Games are unlocked once it reaches its kid stage. These are fairly simple, and include things like clapping back a pattern that it makes, or asking it a yes/no question and hearing it answer. The games are all listed on the same sheet that explains what all the eye colors mean. Some kids just don’t get into these kinds of toys, and we can see how disappointing it would be to spend this kind of money on something that ends up sitting on a shelf. Unfortunately, we haven’t found any tried and true method of being able to guess whether a kid will really take to the toy or not. 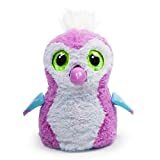 For the most part, our testers who liked Furbys really enjoyed Hatchimals, though there were a few kids who found the hatching so amazing that everything after that just lacked the same enthusaism. In a few instances, the animal may get stuck in the hatching phase. This could be because the animal goes to sleep during the hatching and won’t wake up long enough to finish the process, or the toy seems to stop functioning properly. If the toy stops working, it may continue to make whirring sounds, but it won’t actually be breaking through the eggshell. Spin Master has been quite attentive to customers who get bum critters. If you received a defective toy, call Spin Master’s Customer Care line at 1-800-622-8339. They’re available Monday - Friday, 10am to 6pm Eastern Standard Time. Spin Master can also be contacted through their Facebook account, at https://www.facebook.com/SpinMaster Send them a private message explaining the problem, and they should get back to you with a solution. Will require 2 AA batteries eventually. A total of five different species are available. Each species has at least two color options. Draggles and Pengualas can be purchased at any toy retail store, while the other three species are store exclusives. Bearakeets are found at Target, Burtles are found at Wal-Mart, and Owlicorns are found at Toy R Us.